HomeEra Of ‘Smart’ Touch: This Phone Accessory Can Literally Touch Its User Back! Most modern smartphones have multi-finger touch sensitivity. This means a device can distinguish as many as ten individual fingers when users are touching its screen. But what would a phone do with a finger of its own? A Ph.D. researcher from France decided that this was an appropriate avenue to explore. The result was MobiLimb, a device that begins in a micro-USB interface so that it plugs into a typical Android phone and ends in a triple-jointed, straight appendage. MobiLimb has been invented by Marc Teyssier, a graduate student at the Sorbonne and Télécom ParisTech, and his team (Gilles Bailly, Eric Lecolinet and Catherine Pelachaud), to work on the apparent limitations in mobile device use and function. These researchers have also developed various outer shell types for MobiLimb, one of which is shaped and textured to look like the human finger. The product includes a matte black, more traditionally robotic-looking outer casing, including a variant with a tapered point. There is a shell more like a tail, which gives the MobiLimb the ability to look as though it is wagging the appendage (shown mimicking a 'waving scorpion tail' on its paired phone’s screen). Under this shell, four motorized actuators are found, which control and form the ‘finger’ joints. They are PZ-15320 servos, described as capable of dragging a phone of up to 130g in weight and capable of a pressing force of up to 0.8 newtons (N). These actuators are also augmented with a soft-touch potentiometer so that MobiLimb can sense its environment. Finally, the robotic parts are connected to a micro USB connector and an Arduino controller. They form a phone interface within an enclosure. Therefore, the user can control and program this accessory through open-source software. 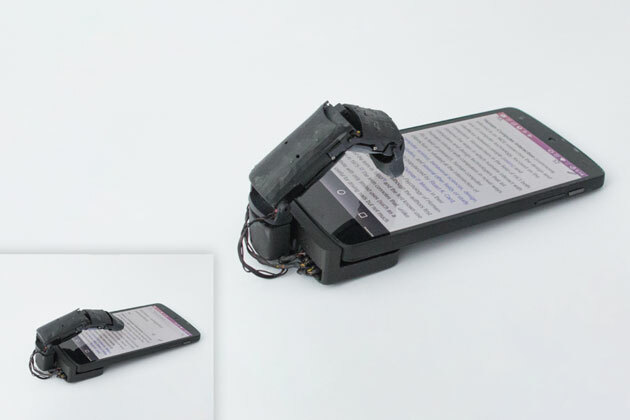 Despite MobiLimb's user-alerting and phone-dragging properties, it is also capable of raising and tilting the phone upward, resembling a robotic phone stand. This may make accessing content on phones easier and fun. In addition, MobiLimb can grip onto the user’s hand while they are carrying the phone. Therefore, it may enhance and improve phone use for people with functional challenges. 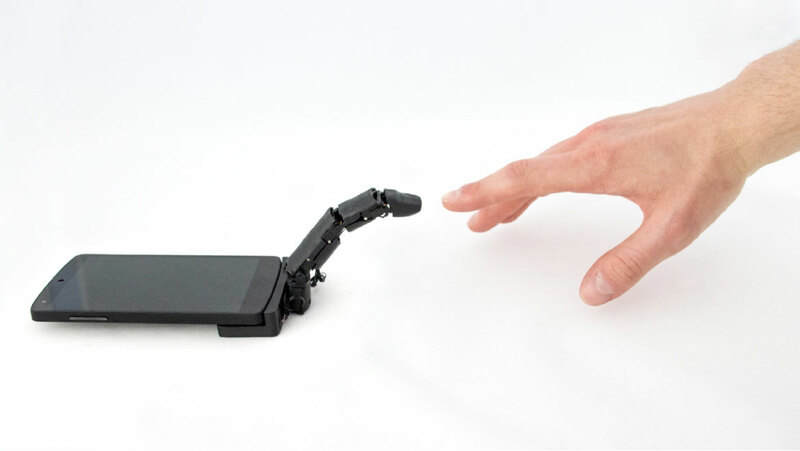 The appendage can also be fitted with LED lights and other optional accessories such as haptic modules. Besides these people, for whom is MobiLimb built? Perhaps, robotics enthusiasts? Teyssier and his team may not have a concrete answer to this question as they have no plans of selling MobiLimb in any form. However, those who do want to attach this prop to their device are in luck. The creator has made the design, operation, and manufacture-instructions for the MobiLimb, open-source. So, Who Wants to Build a Finger for their Phone? The development of this may be possible, as most of the components (particularly the Arduino module) are readily available from the hobby-robotics retail space. Teyssier and his colleagues have also presented the MobiLimb at the ACM User Interface Software and Technology Symposium of the 2018 UIST Conference. If nothing else, this project has proven that mobile phones can move on their own – given the appropriate attachments, obviously!